“The award-winning waterpark design/build firm, Aquatic Development Group (ADG), has designed and is building the indoor waterpark at The Kartrite. 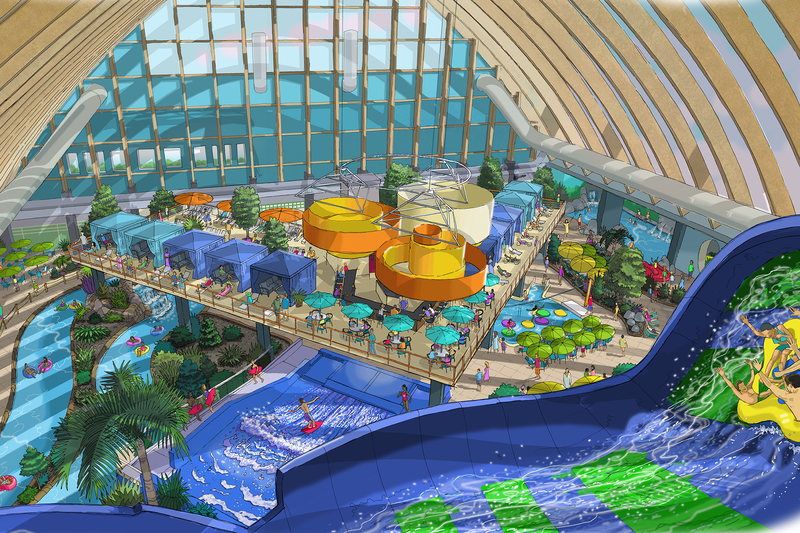 ADG has provided planning, design & construction of more indoor and outdoor water park hotels & resorts than any other company in the aquatic industry, including Aquatopia at Camelback Resort in the Poconos on which the Kartrite was modeled after, and most recently, the hotel & indoor waterpark resort at the Gaylord Opryland in Nashville. Inspired by the architecture of indoor waterparks in Europe, ADG designed The Kartrite with unobstructed column-free construction that features a barrel-shaped transparent Texlon® roofing system that will bathe visitors in natural sunlight and provide the ideal conditions for lush landscaping all year long.